A grey striped tabby is sitting on a window ledge. 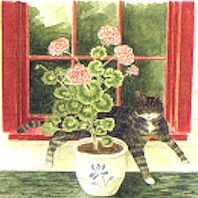 A large pot of geraniums is in the foreground. These 3 ply beverage paper napkins open up to 10" x 10". 20 napkins per package. Manufacturer is discontinuing this item. 5 packages left.